You see, tofu is the perfect agent to add to a meatball to ensure the best texture. If you’re curious about how to make meatballs, be sure to consult the instructions in the margin for the perfect measurements! Daikon radish (大根) is a long, white winter radish that has a crisp texture and a mild, tangy clean flavor. And while it’s used throughout the food lexicon of many Asian cultures, daikon may be most popularly known as the julienned pickled radish that is served with Vietnamese banh mi sandwiches. For this ground chicken meatballs recipe, we’re cooking the meatballs atop grated Japanese radish. 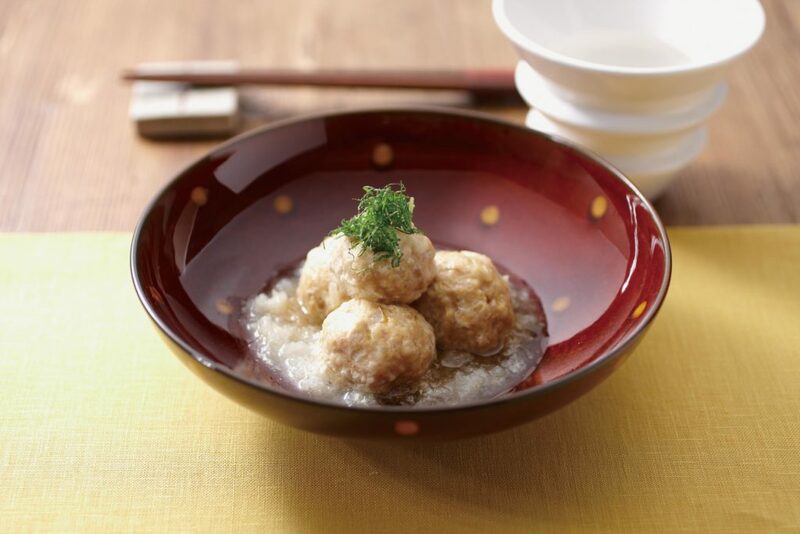 The mild astringency of the daikon meets the savory flavor of the tofu and chicken meatballs and becomes an absolute flavor bomb! Daikon isn’t just a yummy member of the veggie family. Aside from its great texture and flavor, daikon is high in Vitamin C, phosphorus and potassium. Low in calories and high in fiber, this cruciferous vegetable is known to strengthen the immune system and contain enzymes that aid digestion. HOW DO YOU MAKE CHICKEN MEATBALLS IN A RICE COOKER? Simply place your rice and water into the inner pot of your rice cooker. Then load your chicken meatballs into your Tacook cooking plate. When you use the Synchro-Cooking setting, steam generated from the cooking rice will cook your meatballs at the same time. We love science. Oh, and meatballs… we love meatballs too! We know you and your family will love them as well! Meatballs come in many flavors and forms. We absolutely LOVE Italian meatballs – and we’ll always have a soft spot in our hearts for Swedish Meatballs. This chicken meatball recipe is easy to make, and absolutely packed with yummy Asian flavors. Let’s hear it for delicious and easy chicken recipes at dinnertime! Drain the hard tofu, and crush it with your hands. Chop the onion finely. Peel and grate the radish. Mix the ground chicken, hard tofu, onion, and eggs, bread crumbs, soy sauce, and mix them well. Shape into bite-size balls. Spread the grated radish in the tacook cooking plate and add 2 on top. Add the noodle sauce on top. When cooking is completed, place the dish on the serving plate. Sprinkle with the green perilla leaf that is cut into thin strips.